Most receptacles manufactured by Glaro Inc. now come standard with removable plastic inner liners. 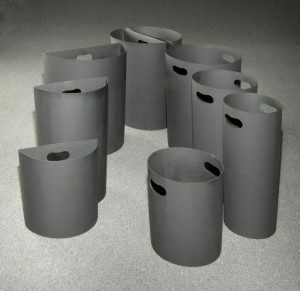 Steel inner liners for round receptacles will continue to be available upon request (at an additional cost). Most waste receptacles have been upgraded to include plastic liners. Single purpose recycling receptacles now have a single round removable molded plastic liner. Molded plastic inner liners may be purchased separately for the Value line and Connected Stations which do not include liners. Dual purpose recycling receptacles will now have two separate molded half round plastic inner liners. Triple purpose recycling receptacles now have two separate molded half round plastic inner liners. One of those two liners will hold two poly bags. Only the BPW-20 triple purpose receptacle will continue to have a removable steel liner. For more information about Glaro Inc. products or to answer any questions, please call 1-888-234-1050.